Everyone wants to know how long before I’m healed? I did. If you’re reading this you’ve probably thought about it too. I think it’s completely natural to want to know when you’ll stop feeling so bad. That doesn’t help much when your stomach is knotted up in pain. Your colon is bleeding and you feel like every day is a struggle to finish. If each day is filled with pain, it can be hard to see a bright future. Let’s say you are feeling pretty sick and maybe you’re using the bathroom 6+ times a day, missing work, feeling awful and you’re ready for a change. You decide you want to do something natural that actually helps correct the root cause of your problem like changing your diet. All is good right? Usually for the first few weeks… until the newness of the diet wears off. Of course, that’s if you actually get started. Many people don’t even get started, they quit before the first bite. The reason? They start thinking about how nice it would be to feel good and be healthy. Then, their thoughts get jarred back to their current reality of sickness and pain. This comparison mindset starts to consume them and all of sudden it feels like it’s impossible to achieve success. I never want to hear those words from you! That’s why it’s time to clear up this misconception about how long it takes to heal. It is a HUGE mistake to think that transitioning from each phase of the diet or progressing up each metaphorical health step takes the same amount of time. 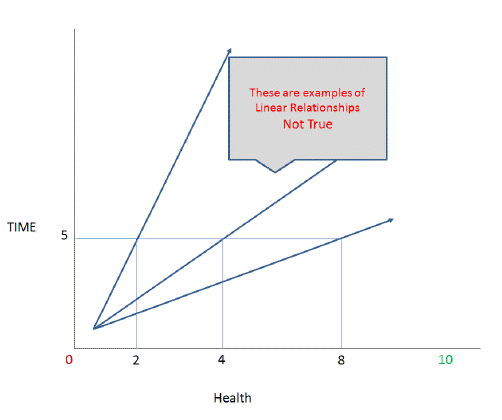 Most people think in terms of linear relationships. We are taught from a young age that for every action there is equal and opposite reaction. This type of thinking is great for morals but not well-suited for our relationship with health. In health, things aren’t this orderly. They don’t follow set schedules as much as our logical brains would like them to. A linear healing relationship for a natural diet would look like a straight line. A false example: Each day you are on the diet, you get .25 points better. So, for every 4 days on the diet you would get better by one point. So, if you were measuring on a scale of 1-10 and wanted to go from feeling like a 2 to feeling like a 6, it would take 16 days on this new diet. STOP! Please don’t think like this… No one spends 10 days in every phase of SCD and keeps getting better forever. Pinning your hopes of renewed health using this kind of logic sets you up for failure. Instead, destroy the reality that you will feel better in X number of days, which will open a space for a bigger and better reality to happen – a new reality in which change can happen radically fast. This might confuse you, but it is actually really good news. Here at SCDlifestyle our goal for you is to get to your “Feel Good Zone” as fast as possible. The simplest way I can explain this “zone” is that you don’t experience acute problems. No more diarrhea, constipation, bleeding or constant pain. Your disease is under control and you can finally get your life back because your pain is gone! Think of it like this: if you imagine a scale of 0-10, with zero being death and ten being perfect health, we want to get you to a 6 as fast as possible. From there, you’ll have a stable base of safety, energy and understanding so that you can tackle the rest of your health problems if you choose. The cool thing is if you’re at a 1, then getting to a 6 goes much faster than you’d ever imagine. We believe it happens in accordance with Power Law Mathematics. “What? !” you say. Stay with me. As you can see from the graph below, it takes much less time to get to feeling like a 6 than it takes to get to feeling like a 10. However, the next 20% of health will consume the final 80% of your time spent getting well. This is great news for all of us who are sick, because it means you are only a few changes away from feeling pretty darn good. 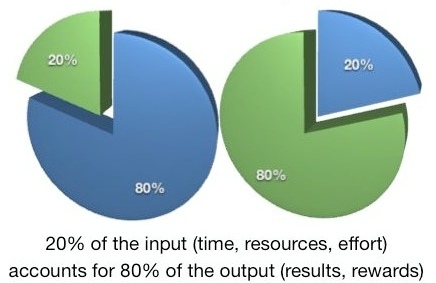 The great thing is most people don’t even know how good 80% feels. The truth is that from 1 to 10 is a heck of a journey. I’m not there yet, but shooting for the stars and landing on the moon is still pretty awesome. Contrary to what I thought when I started this journey, I’ve never been here before. I’ve never felt this good. And it’s much better than I could have imagined. But to really see the results you want you’re going to have to destroy any instant gratification linear thinking about what you invest into your health. It is a poverty mindset that will hold you back. Instead, focus on maximizing your efforts (inputs for better health), give yourself time, quality food, supplements, thoughts, coaches, tests, doctors, reduce stress, positive emotions and keep learning from trusted sources. 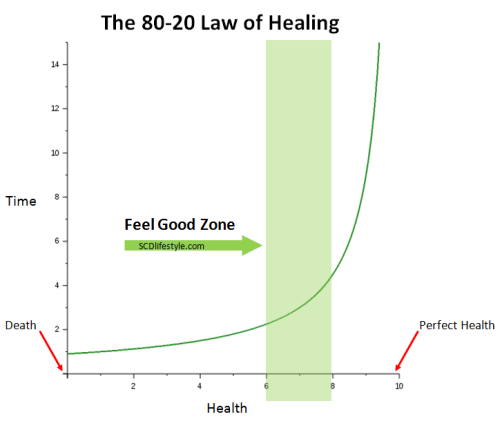 Has your healing obeyed the 80-20 Law of Healing? I’d love to hear below. Ditto to the other responses. I was thinking of going back on Xifaxan for a jump-start knowing fully that it’s the diet that will resolve my issues. I agree with Laura. I keep wanting someone to tell me exactly how long it will take to heal completely or creating unreasonable expectation in my mind. But after almost a year on SCD, I have come so far in my healing. I also experience some set backs but they are really minor in comparison to how I used to be. We just need to keep going strong! It’s like you read my mind. I was just considering the past few days if I should go back on the drugs. I didn’t realize it, but I guess I have been expecting a linear progress of sorts. It really bothers me when I seem to go backwards cause I worry that I won’t be able to stop the decline. A year ago I was that person at 1, a few months ago probably 8 or 9, now a little lower, but still better today than yesterday. I need to find a balance between working hard on that 20%/expecting perfection and realizing there are going to be ups and downs no matter what I do/just going with the flow and enjoying the amazing health that I do have.